One of the “spec” houses designed for developer Henry M. Peterson. The featured element of this house is a round-arched front door, magnified by a wide surrounding brick arch. The round arch is a motif that recalls the ancient Romans, who perfected the structure and decoration of round arches over several centuries. Arches then became a dominant feature in the Romanesque architecture of the 9th to 12th centuries. In the 19th century, Henry Hobson Richardson copied elements of the Romanesque, including big round arches, in the style he created that became very popular and is known as Richardsonian Romanesque. The polygonal termination at the south end of the front façade allows more windows that provide additional views and bring in more natural light. This polygonal bay faces a polygonal bay on the house next door, which was designed at the same time by the same architects. Coincidence? Not a chance! 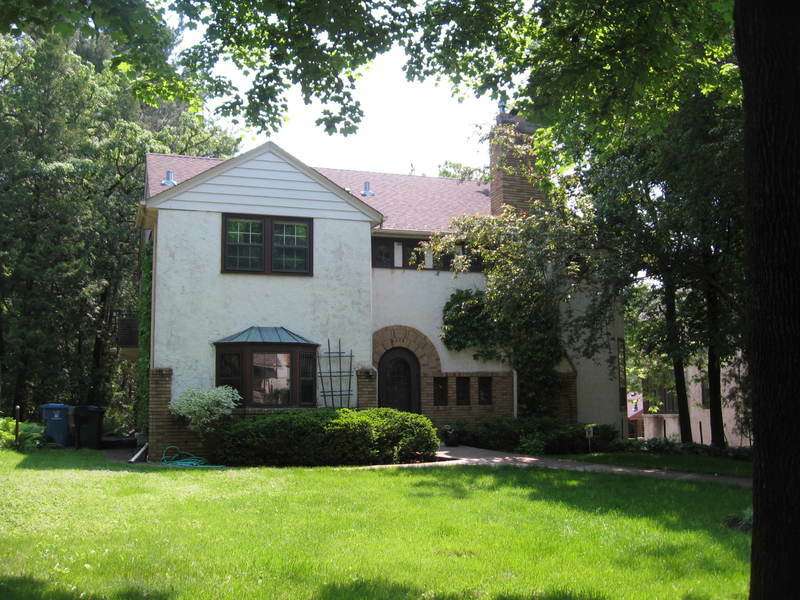 Richard L. Kronick, “5315 Upton Ave. So.,” Minneapolis Historical, accessed April 22, 2019, http://minneapolishistorical.org/items/show/117.